Computer or Manual Cheques are available. Computer cheques can be ordered compatable with PCLaw, Quickbooks, Simply accounting and more. 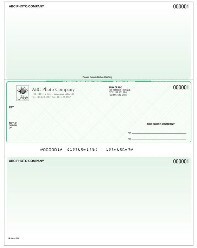 Manual cheques are available with tear stub in both single sheet and 2 to a sheet. Includes your single colour logo at no additional charge! We also now offer an affordable alternative to the bank for deposit books.Bring in a sample of your current layout and get a quote! We usually provide 1 week service on cheques. Cheque binders are also available ($20.00 for single cheque version, $35 for double). The pricing shown on this page is for the standard versions of both computer and manual cheques. Various colours are available for this price. Other versions including premium cheques are available.